When I saw some baby pears at the grocery store, I couldn't resist buying a few. 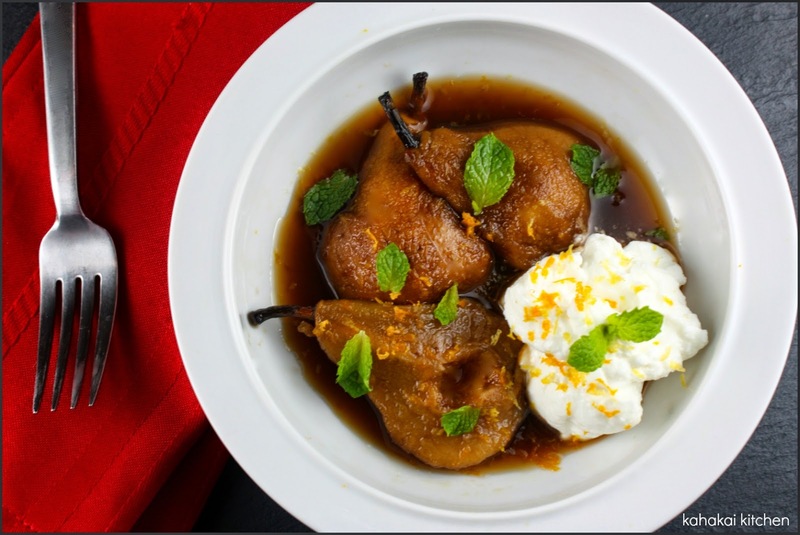 This Diana Henry recipe for Pears Poached in Earl Grey seemed like a fun way to use them. This is a great light dessert if you have over-indulged over the Thanksgiving holiday, served with thick Greek yogurt and mint and orange zest scattered on top. 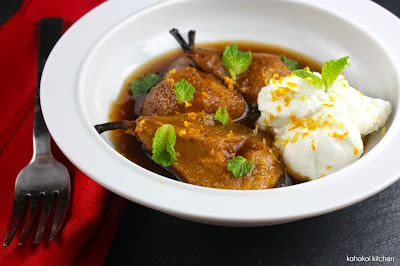 Diana says, "These pears end up a wonderful rich toffee color and, if you are able to leave them sitting in the reduced syrup overnight before serving, they will absorb more of the subtly smoky tea flavor. serve them with Greek Yogurt." Put three of the tea bags into a heatproof bowl with 4 cups of boiling water and let brew. Discard the tea bags and pour the tea into a saucepan wide enough to take all of the pear halves in a single layer. Add the sugar. Stir over medium heat to dissolve the sugar, then add the lemon juice, lemon and orange zests, and the pears. Bring the liquid to a simmer, then reduce the heat and gently cook the pears until tender. How long this takes depends on how ripe your fruit is. Keep checking, sticking the tip of a sharp knife into the flesh. Once the pears are ready, scoop them out with a slotted spoon and set them in a dish where they are not touching each other, so they can cool down and stop cooking (if you pile them up on top of each other, the heat will continue to soften them). Remove the zest from the poaching liquid and bring it to a boil. Add the final tea bag and simmer until the liquid is reduced to about 1 generous cup. The syrup will thicken as it cools. Let cool completely, strain, then put the pears into a serving dish and pour over the syrup. Notes/Results: The syrup has so much flavor from the tea and the combination of the sweet pears and tangy yogurt with the citrus and spice of the tea is a winner. I did reduce the sugar slightly as I don't like things too sweet. Easy to make and tastes great, I would make these again. 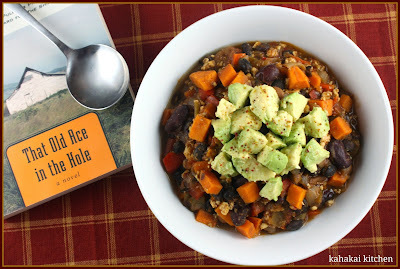 I am linking this recipe up to I Heart Cooking Clubs where it is Potluck week. The chance to make any Diana Henry recipe or a recipe from any previous IHCC chef. You can see what everyone made by checking out the picture links on the post. However you are celebrating--enjoy the day! I rarely open a new cookbook and start from the beginning. Usually I immediately head for the soups--especially when it comes to Yotam Ottolenghi, who is the master of combining ingredients and flavors into truly fabulous soups. 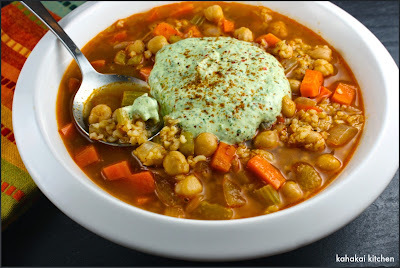 So when I received my copy of Plenty More: Vibrant Vegetable Cooking from London's Ottolenghi, I went right to the Simmer section where this Spicy Chickpea and Bulgur Soup caught my eye. I made a couple of small changes--subbing the bulgur for freekeh (a roasted green wheat) because I have a large bag from Costco that needs using up, and swapping in Greek yogurt for the crème fraîche in the feta paste (cheaper and more protein). Otherwise, I left Ottolenghi's recipe alone and ended up with a hearty, warm, and spicy soup masterpiece. Ottolenghi says, "This simple and soothing soup, minus the optional feta paste, can most likely be made with ingredients you already have in your cupboards and fridge (and if you don't have some celery stalks and a couple of carrots regularly lying around in your fridge, plus a jar of good harissa, I highly recommend that you do: they form a good base of some of my favorite sauces). The dairy-free soup works well without the paste, but a spoonful on top elevates a midweek supper into something pretty special." Put the oil in a saucepan over medium heat. Add the onions and sauté for 5 minutes, stirring from time to time, until translucent. Add the garlic, carrots, and celery and continue cooking for another 8 minutes. Add the harissa, cumin, coriander, and caraway seeds and cook for a further 2 minutes, stirring well. Gently mix the chickpeas into the vegetable mixture--you don't want them to break down--along with salt and plenty of black pepper. Add the stock and bring to a boil. Turn down the heat and simmer gently for 10 minutes or until veggies are cooked through. 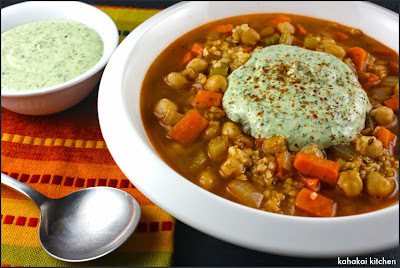 Before serving, add the cooked bulgur to the soup and bring to a gentle simmer. 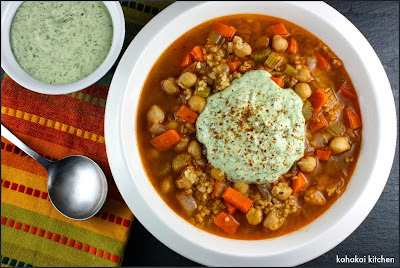 Divide the soup among bowls, add a spoonful of feta paste to each bowl, and serve at once. Notes/Results: So good! 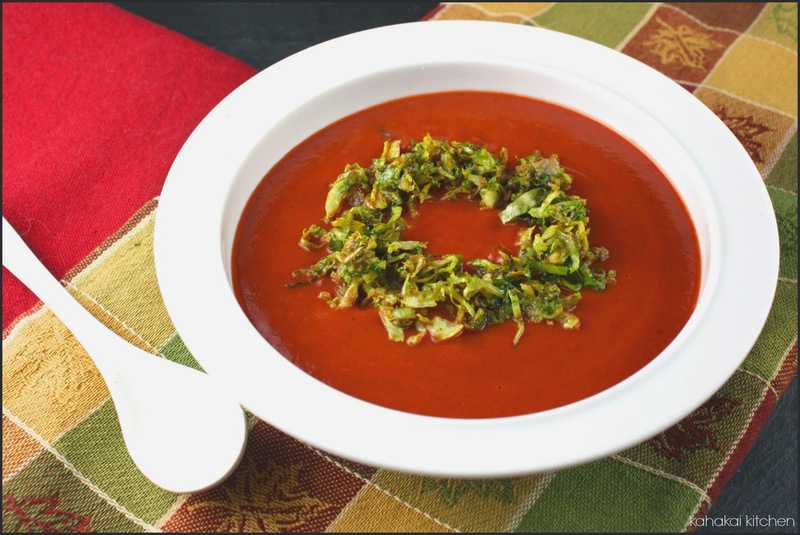 This is a bowl of just-rightly-spiced soup with wonderful flavor. 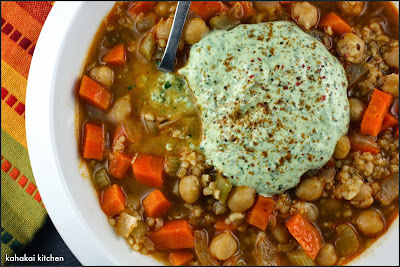 It tastes great on its own with the slightly smoky heat, then when the cooling, herby, creamed feta paste mixes in, it elevates the soup to another level.The caraway seed is a (pleasant) surprise in this soup. Harissa paste often includes caraway, but when you get a small burst of flavor from a caraway seed, it adds a different, unexpected flavor. I started with 1 1/2 tablespoons of harissa but after tasting it, I added the other 1/2 tablespoon finding it just spicy enough for me--I feel the heat but it doesn't overwhelm. The freekeh or bulgur, along with the chickpeas, make this soup satisfying. If you don't plan on serving all of the soup at once, I recommend keeping the grain separate and adding it in when you warm the soup to keep the texture. 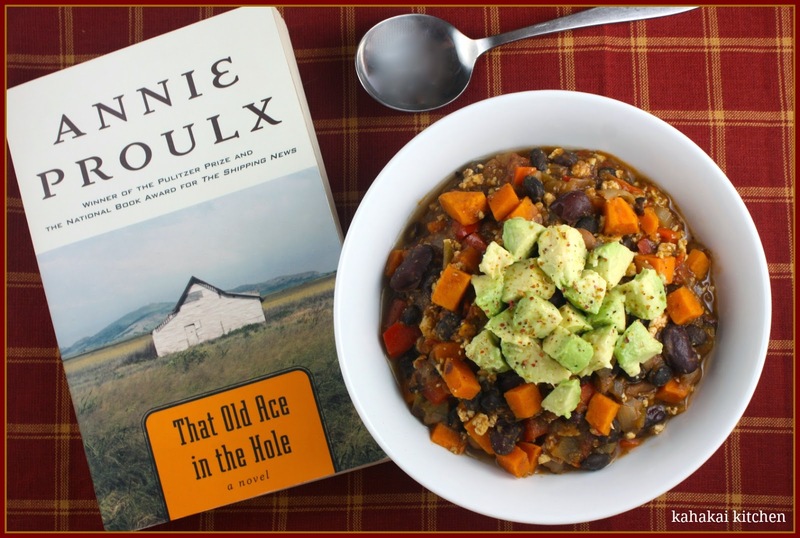 A truly wonderful soup--simple but special, I will make it again. 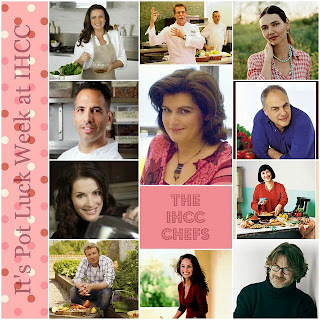 This delicious soup is being linked to I Heart Cooking Clubs where this coming week is November Potluck--the time to make any Diana Henry dish or any recipe from one of our previous IHCC chefs. You can see what dishes everyone made by checking out the picture links when the post goes live. Let's have a look into the Souper Sundays kitchen and see who is here and what they brought. Janet of The Taste Space shares hearty Sweet Potato and Coconut Curry and says, "And like that, winter arrived. The snow dropped in full force and actually stuck around a bit. I had a few short weeks for biking. My broken leg meant I was not fit for biking earlier this fall but it was nice while it lasted. And what is better during the cold weather than a warm bowl of curry? To keep things simple in the kitchen, I have resorted to remaking some favourites and making twice as much. ... So, please, grab yourself a huge sweet potato and make a double batch. It freezes well should you want to save it until a colder day." 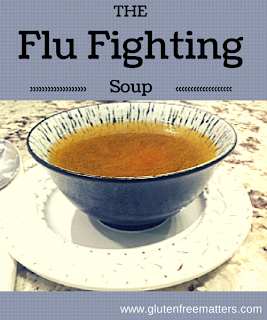 Judee of Gluten Free A-Z Blog is here with her Flu Fighting Soup and says, "Our temperatures hit 22 degrees F this week in Bucks County, PA and everyone is sneezing and hacking. I made a new soup. It's really a cabbage vegetable soup, but it's so rich in antioxidants, I'm calling it a flu fighting soup! ... You don't have to have the flu to enjoy a bowl of this delicious soup. 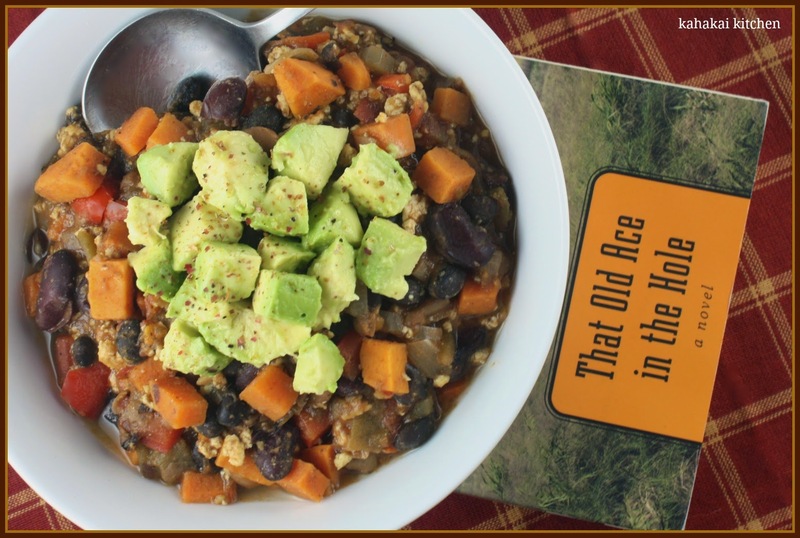 However because cold and flu season are upon us, we can help boost our immunity with the antioxidants in soups like this." 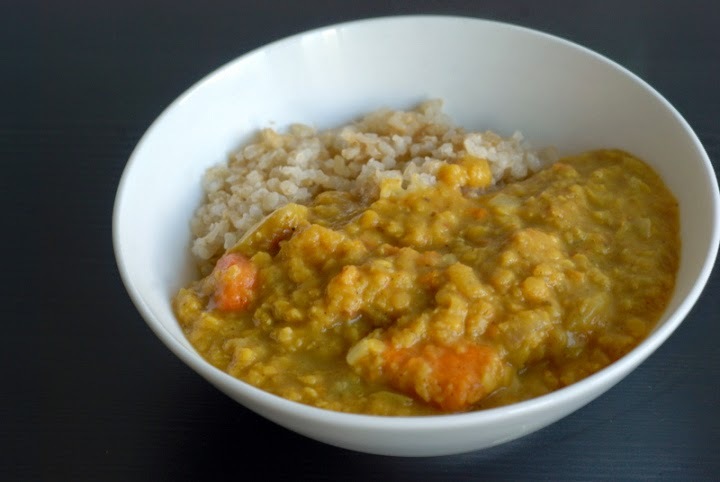 Debbie of The Friday Friends brings Spanish Style Split Pea Soup (Potage de Guisantes Barcelona) this week and says, "I love split pea soup. 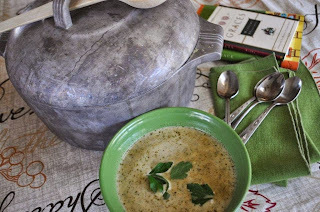 I especially love the smokey flavor from the ham or ham hocks it cooks with, but this soup from the Dairy Hollow House Soup and Bread, has a pea soup made with no meat. Perfect for vegetarians OR anyone who wants a good soup! 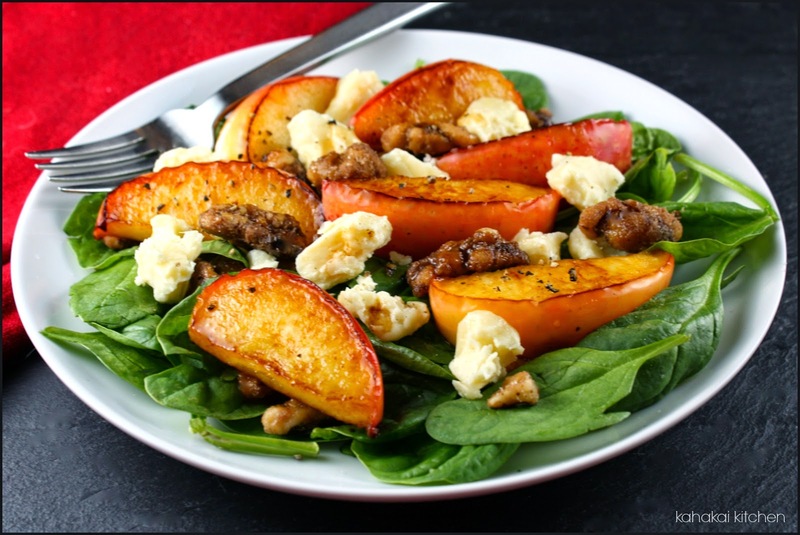 I loved the addition of caramelized onions and tomatoes." Deep, gritty, eclectic glimpses of life and humanity--a short story collection that encompass multiple genres set in the present, the past and the future, is Prism by Roland Allnach. 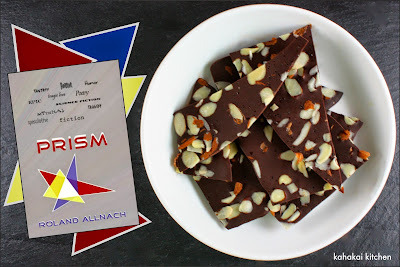 Kahakai Kitchen is a stop on the TLC Book Tour for Prism (and my guess is this is the only blog pairing the review with a recipe), so I'm serving it up with some shards of Dark Chocolate Bark with Almonds & Smoked Sea Salt--rich, dark and fractured like the stories themselves. I have read a few short story collections over the past months and I find it is a genre that I increasing like for the chance to drop into different worlds for a brief time. Prism is such a diversity of stories (seventeen in all), dipping into horror, tragedy, dark humor, science fiction, mythology, and even poetry, and it is impressive to see an author so talented in the different genres. With the broad assortment, it is understandable that not every story will resonate with a reader and so I found myself extremely enjoying the first half of the book and bored and impatient in the second half. Part of it was me getting behind this month and trying to read the book in a couple of days--I think this book is best delved into a couple of stories at a time. Part of it might have been the ordering of the stories. The first half of the book felt crisp, several of the stories appealing to my enjoyment of being slightly creeped out like "11"-- where a man has been terrorized by someone who has been lurking after him most of his life. "Creep"--was a story about a little boy who wakes up thirsty and is afraid of what might happen as he leaves his bed to head to the bathroom for water. I loved "Flowers for Colleen”--where two serial killers meet accidentally and end up having coffee and scones. (Who knew serial killers feel isolated and long for a bit of community?) I started to drag with “Titalis”--a well-written story with a Shakespearean tragedy feel to it and the longest story in the book by far. It was followed by a truly epic poem "Typhon and Aerina" that just didn't seem to end--and the formatting in my ARC e-book was wonky which made it disjointed to read. I will confess that poetry is usually hit or miss for me and then that the epic poem was then followed by another poem about a 'well-endowed gunslinger' that just did not seem to fit the mood of the rest of the book and fell a bit flat. Although the entire book wasn't a match for me, based on the first half of Prism I would definitely read more from this author. His writing is strong, smart and witty, as well as being slightly twisted (in a good way), and the beauty of this collection is that others will probably really enjoy the parts that I didn't like as much. Author Notes: Roland Allnach, after working twenty years on the night shift in a hospital, has witnessed life from a slightly different angle. 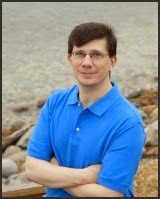 He has been working to develop his writing career, drawing creatively from literary classics, history, and mythology. 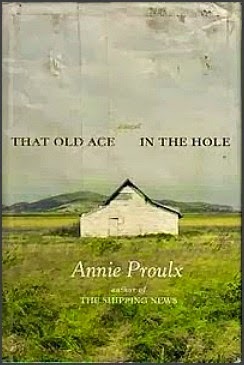 His short stories, one of which was nominated for the Pushcart Prize, have appeared in many publications. His first anthology, Remnant, blending science fiction and speculative fiction, saw publication in 2010. Remnant was followed in 2012 by Oddities & Entities, a collection spanning horror, supernatural, paranormal, and speculative genres. Both books have received unanimous critical praise and have been honored with a combined total of twelve national book awards, including honors from National Indie Excellence, Foreword Reviews, and Readers’ Favorite. Prism marks Roland’s third stand alone publication. When not immersed in his imagination, Roland can be found at his website, rolandallnach.com, along with a wealth of information about his stories and experiences as an author. Writing aside, his joy in life is the time he spends with his family. You can also find Roland on Facebook. 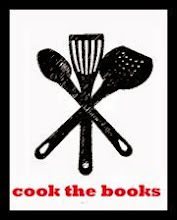 Not a book that inspires foodie thoughts--a few of the stories are downright appetite suppressing in fact. I decided that my favorite stories in Prism called for something dark, seductive--maybe something slightly nutty? 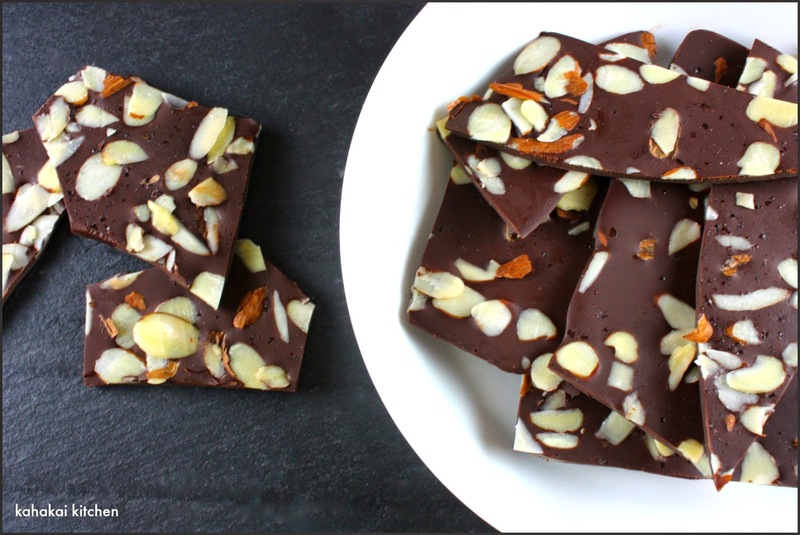 Dark Chocolate Bark with Almonds & Smoked Sea Salt broken into jagged pieces seemed appropriate to fit the mood of the book. Break chocolate into small pieces and melt (either in microwave or using double-boiler on stove), stirring until completely melted. Evenly pour chocolate onto parchment-lined pan. 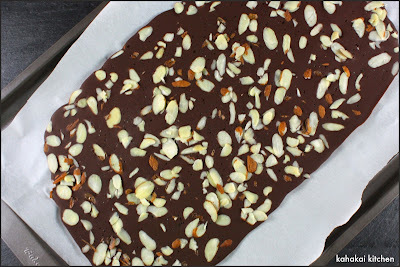 Sprinkle sliced almonds on top of chocolate and sprinkle salt evenly over. Place pan in the refrigerator until chocolate sets completely--about 1-2 hours. Break the chocolate into pieces and serve. Keep in a airtight container in the refrigerator or in a cool dark place as the chocolate melts easily. Notes/Results: An easy and great way to liven up plain dark chocolate and make it something a bit special. 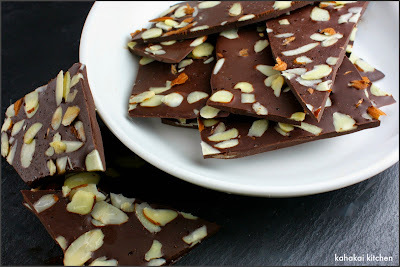 It's been a while since I made chocolate bark and I happened to see a variation of this one (the original recipe included coconut) and started craving the sweet and salty combination. I have a grinder of smoked sea salt from Trader Joe's that I used to impart a bit of smoky flavor. Next time I will grind it coarser so you can see the crystals on the chocolate but the flavor of this was spot on. It's rich enough that a piece or two satisfies. I will make it again. 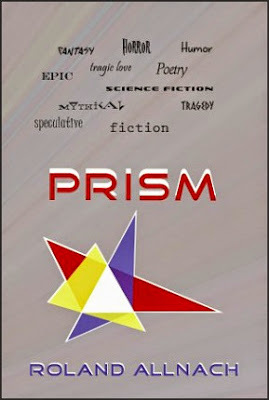 Note: A review copy of "Prism" was provided to me by the publisher and TLC Book Tours in return for a fair and honest review. I was not compensated for this review and as always my thoughts and opinions are my own. You can see the stops for the rest of the Book Tour and what other reviewer thought about the book here. Local ahi tuna steaks seared with a touch of balsamic glaze, served with sweet and sour Sicilian stemperata sauce--chunky like a salsa. 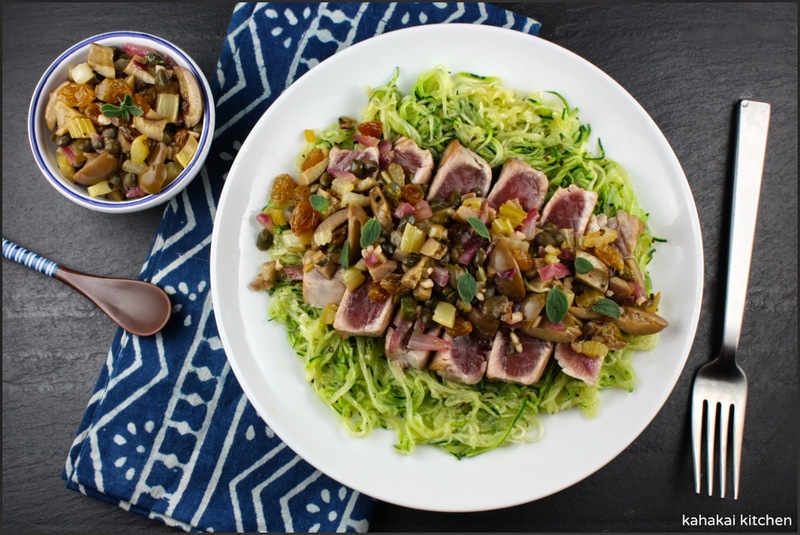 This is a quick-to-make dinner with great flavors. I wanted pasta but didn't want all the calories and extra carbs so I kept it fresh with some spiralized zucchini noodles (we get local zucchini year-round here), sauteed with a touch of olive oil and oregano to match the sauce. Diana says, "Sicily is tuna heaven. The fish is served in hundreds of ways--in countless tomato sauces, with almonds, with oranges, with vinegar and onions, raw, marinated, with pasta and without. Many of the dishes, like this one, are sweet and sour, showing the island's Arab legacy. 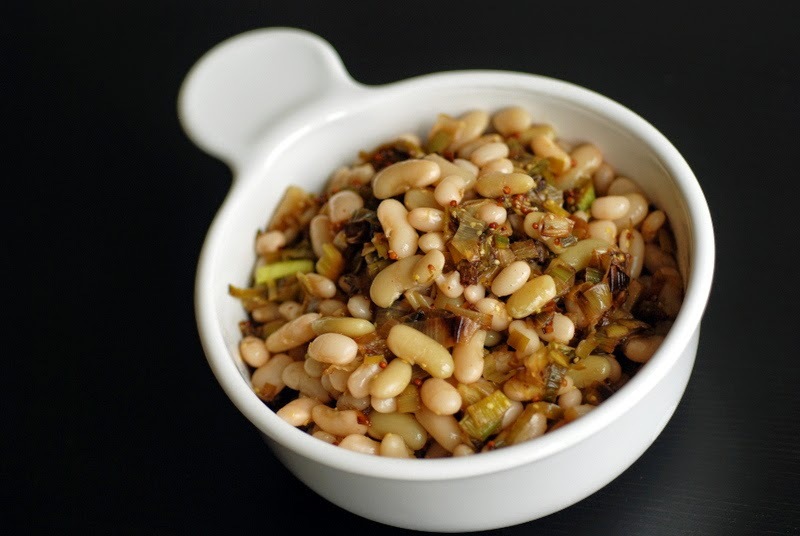 This sauce is a cinch to make , can be prepared in advance, and tastes great." For the sauce, heat the olive oil in a heavy-based frying pan and fry the onion and celery until soft and just beginning to turn golden. Add the garlic, olives, capers and raisins and cook for another couple of minutes. Add the oregano and vinegar and cook until the vinegar is evaporated. When you want to serve, rub olive oil, salt, and freshly ground pepper on each side of the fish and heat a ridged griddle or frying pan until very hot. Cook the tuna for 1-1 1/2 minutes on each side. This will give you tuna which is like a rare steak – charred on the outside, pink and melting inside. 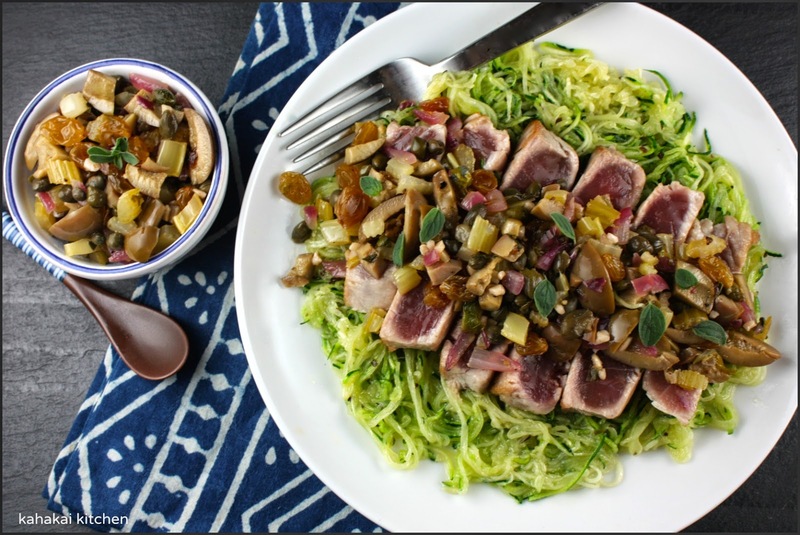 In the final few seconds splash in some balsamic vinegar and let it bubble away, turning the tuna over once in the vinegar. It gives a wonderful glow. 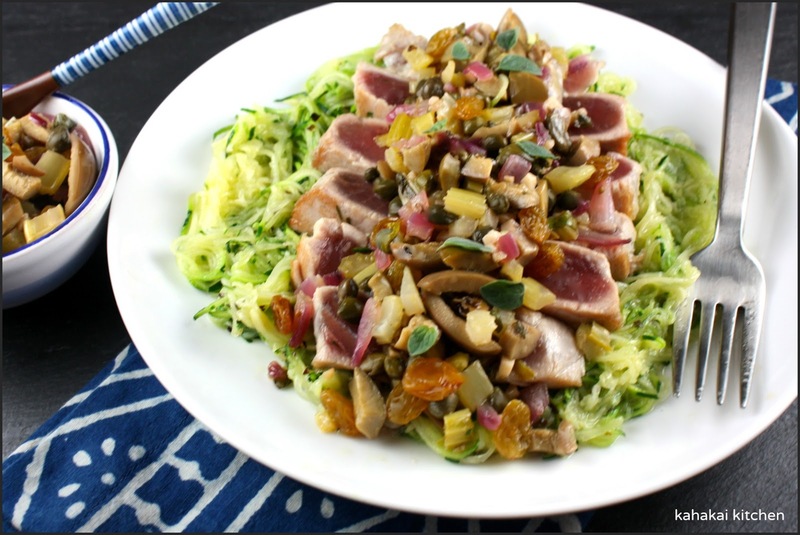 Serve the tuna immediately with the stemperata sauce and a drizzle of extra-virgin olive oil. 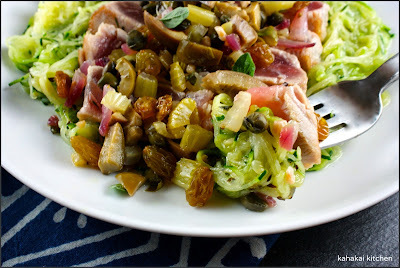 Notes/Results:If you are a caper fanatic and olive fan like I am, you will like this dish. The sweet/sour combination and crispness of the sauce is a wonderful contrast for the creaminess of the seared ahi tuna. It worked well on the zucchini noodles too. I was a little leery of putting the balsamic vinegar on the tuna as sometimes the taste overpowers everything, but the small splash (I used a just a bit of a lighter-flavored sundried tomato balsamic) livened it up without competing with the other ingredients. Such wonderful flavors for a really fast-to-the-table meal. I will make this again. This dish is being linked to I Heart Coking Clubs for this week's "Sweet Cloves and Liquid Gold" theme--celebrating the joys of garlic and olive oil. 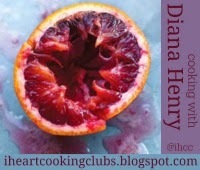 It from the chapter of the same name in Crazy Water Pickled Lemons by current IHCC chef Diana Henry. You can check out what everyone makes by checking out the picture links on the post. 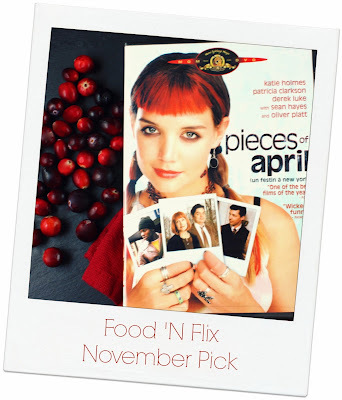 I'm hosting Food 'N Flix for November and my pick is the indie-comedy-drama "Pieces of April" starring Katie Holmes, Patricia Clarkson and Oliver Platt. (The announcement post with all of the details is here.) 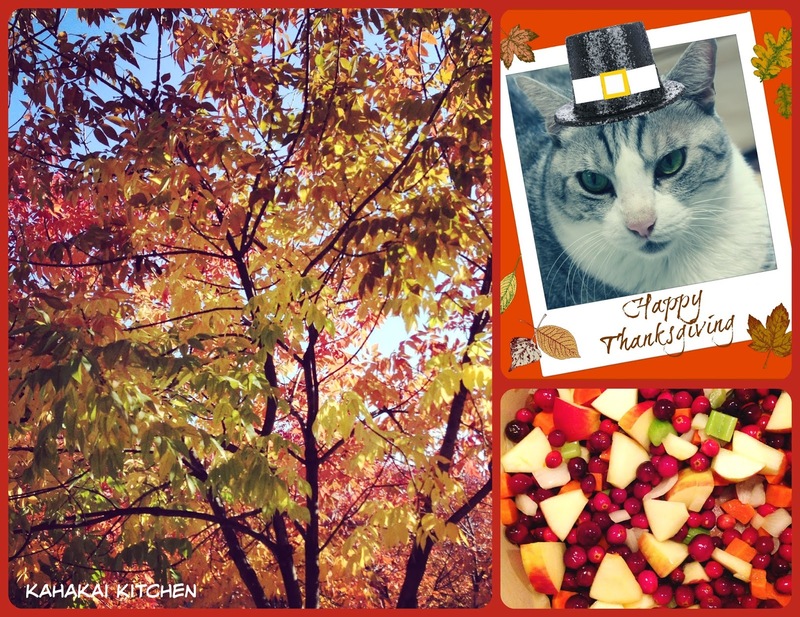 Since I tend to slide in my Food 'N Flix posts right under the wire, I thought as a responsible host, I would change it up and actually post a couple of weeks before the deadline. Plus, if you are tired of pumpkin and squash soups starters and having the standard cranberry sauce on your Thanksgiving plate, here's a new recipe to shake things up a bit--a variation of Giada De Laurentiis' Cranberry Soup with Curried Breadcrumbs Shredded Brussels Sprouts. I saw this movie when it first came out, then again last year when I caught it on cable and loved the story of April Burns, estranged from her family but looking to mend relationships--particularly the one with her difficult mother, before it is too late. A broken oven has April relying on the kindness of strangers to get dinner cooked, while her family begrudgingly makes the long trek into the city. It's got good performances, dark humor mixed with warm and poignant moments, and it's about Thanksgiving. 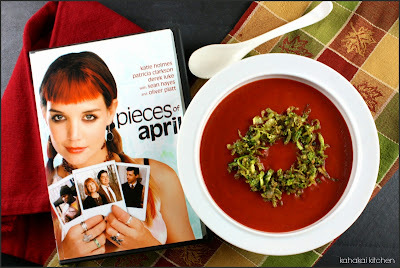 When I re-watched the movie for Food 'N Flix, I took the time to watch the behind-the-scenes featurette about the making of the film and interviews with writer/director Peter Hedges (known for writing What's Eating Gilbert Grape the screenplay for About a Boy) and the cast. If you get the chance, watch both--the film and the extras. April: "I'm the first pancake." Evette: "What do you mean?" Eugene: "She's the one you're supposed to throw out." April: "I like it from the can!" Eugene: "Nobody likes it from the can." Heat a 3 quart sauce pan over medium heat. To the pan add the onion, carrot, celery and 1 teaspoon of salt and sauté for 4 minutes or until the vegetables are beginning to soften. Add the apple and cranberries and sauté for another 2 minutes. Deglaze with the apple juice and add the water, star anise, cinnamon stick and cardamom pods. Bring soup to a boil, and allow it to simmer for 20 minutes. Remove the star anise, cinnamon stick and cardamom pods and cool slightly. Meanwhile, in a small sauté pan, mix together the panko, 1 tablespoon agave, the curry powder and 1/4 teaspoon salt. (I omitted the agave or sweetened and substituted in Brussels sprouts for the panko and used 1/2 tsp of oil to pan-fry them in until the sprouts were crispy and lightly browned.) Place over medium heat and cook for about 3 minutes, stirring often, until the breadcrumbs are fragrant and golden brown. Set aside to cool. 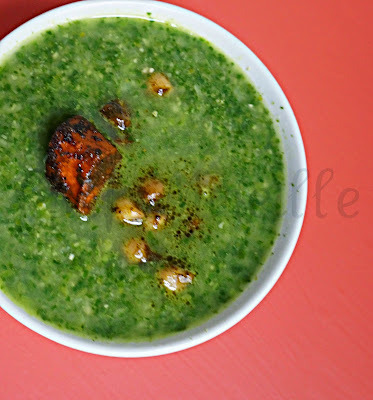 In 2 batches, ladle the soup into the pitcher of a blender and puree until smooth. Return the pureed soup to a pan and bring to a gentle simmer. 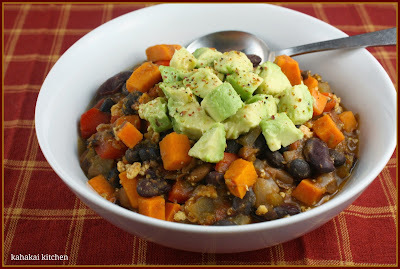 Turn off the heat and add the remaining 1/2 teaspoon salt and 3 tablespoons of agave. 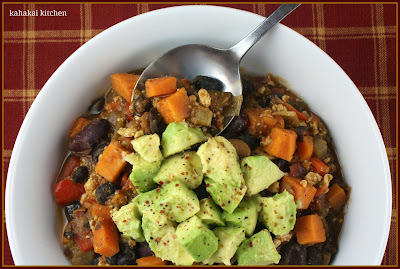 Ladle into bowls and top with the curried breadcrumbs. Drizzle with a little smoked or extra virgin olive oil if desired. Notes/Results: I wondered if this soup would be too tangy or too fruity for my taste buds but it turned out well--a good blend of sweet and savory and a little smoky thanks to the smoked salt and paprika I added. The curried Brussels sprouts were the perfect topping--not that the panko wouldn't be great as well, but I liked the slight bitter greens flavor of the sprouts with the curry with the tangy/sweet. Plus I learned that curried Brussels sprouts are delicious and plan to make a salad/side dish with these flavors. This is a good soup to use as a starter to a meal--rich, but not too heavy and good to serve in a small bowl or cup. I would make it again. As mentioned, I'm hosting this round of Food 'N Flix and I'll be rounding up all of this month's entries right here at Kahakai Kitchen shortly after the deadline of Sunday, November 30th so you still have plenty of time to watch the film and play along. (As host, I decided to actually to get my entry done a couple of weeks before the deadline this time--a rarity!) ;-) If you miss out this month, I TRIPLE-dog-dare ya to join us in December when we will be watching the holiday classic, A Christmas Story hosted by Food 'N Flix's founder, Heather of girlichef! Since it's also Souper Sundays, let's take a look into the kitchen and see who is here and what delicious dishes they brought. Mireille of Chef Mireille's East West Realm shares this flavorful Ottolenghi Spinach Chickpea Soup with Roasted Carrots and says, "Rose water and raz el hanout add a Middle Eastern flavor to this healthy Vegetarian Soup. ... 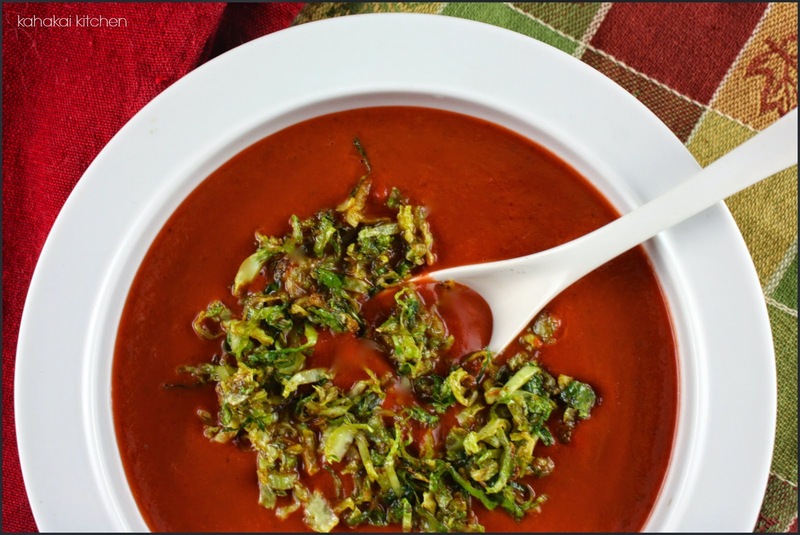 This is a balanced flavorful soup with the light and fresh flavors of the greens, but then the smoky deep flavors that come from the carrots and the raz el hanout. It makes a complete meal with the protein from the chickpeas." Shaheen from Allotment2Kitchen is here with this pretty rice salad and says, "I made this Red Camargue Rice Salad last month. It was my first time cooking and eating red camargue rice. I don't know why, but I had expected the red camargue rice to be chewy like brown rice, but it wasn't and was somewhere in between white rice and brown rice. It did however add texture and faint colour to this very autumnal looking salad. 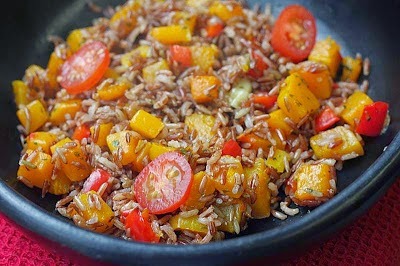 The rice was further enhanced by the flavours of the roasted butternut squash and red peppers, I also threw in some fresh tomatoes." 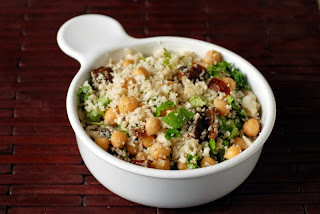 Janet of The Taste Space brings Moroccan Cauliflower Rice and Date Salad and says, "This was also a fun spin on a vegetable salad: cauliflower is riced and tossed with Moroccan spices, dates and cilantro. The savoury spices (cumin and cardamom – although I think cinnamon would have been better) worked well with the sweet dates. My only complaint was that I picked a big head of cauliflower, so I needed more dressing. No fault of the author, as I guess there are truly puny cauliflowers out there."